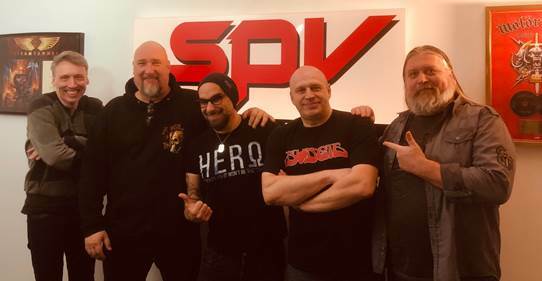 15 years after the arrival of their live recording From The Cradle To The Stage, German metal legend Rage have returned to Hanover imprint, SPV/Steamhammer. The band featuring frontman Peavy Wagner, guitarist Marcos Rodriguez and drummer Vassilios “Lucky” Maniatopoulos is currently busy working on new material for their upcoming album Wings Of Rage (working title), scheduled for release on 10 January 2020. A lead single will be out in September 2019, the second single to be lifted from the album is due to be released just before Christmas. Wings Of Rage is the group’s 25th studio album and will be recorded at the Soundchaser Studio in Burscheid. Peavy promises an offering featuring “the essence of our musical development, the kind of songs that we have stood for since the mid-eighties.”Rage are planning to embark on a festival tour across Europe even before delivering their new material to present, together with the Lingua Mortis Orchestra, the full XIII album live for the first time.